Hello? Congratulations. A little bit bad … You know that I’ve never been outside … I know God’s with me, but it’s not the same, it’s not the same … Same, same … you know that we’re always together in our birthday. Same, same. Take care of yourself. I love you very much, I give you my heart, you know it. We’re both celebrating our birthdays. I carry you in my heart, whatever happens, I carry you in my heart. Always together, always together, you know it. But anyways … That’s the way it is, you understand me? Each one’s destiny. Same, same, same, same. Take care of yourself. God bless you. . I was with the Central American caravan, documenting it as it made its way through Mexico toward the U.S. border. One night in Mexico City, I gave my phone to Hugo Martinez so he could call his dad back home. Martinez, who’d left Tegucigalpa, Honduras, couldn’t get through, so he recorded a voice memo in which he apologized for not saying goodbye to his father before heading north with his 20-something son. When he gave my phone back, we both stared at the floor for a long time. Martinez is one of the 8,000 migrants who left their home countries in the largest convoy ever to travel the migrant corridor. It is easy to reduce their stories into categories: the teenager fleeing compulsory gang service, the mother seeking better opportunities for her children, the orphan. But they are much more than those stereotypes. They are escaping realities we can’t even imagine. I was interested in the people they’d left behind — and their links to home — because they represent the gaps between what we think are their concerns and what really robs them of their sleep. 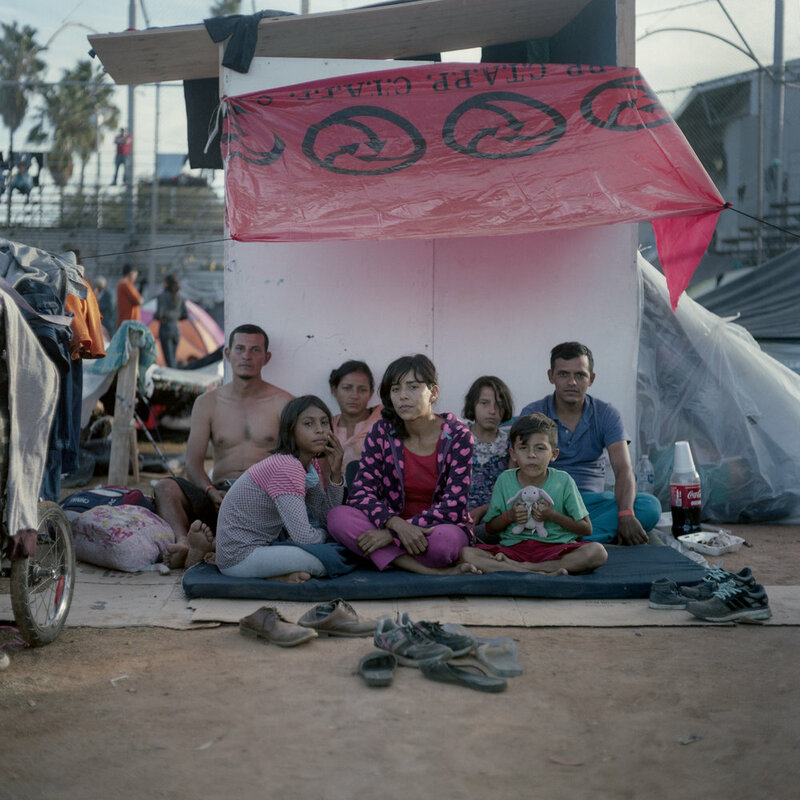 Many migrants hoped, with their departure, to improve the lives of their loved ones back home. When the travelers arrived in Tijuana, I began lending my cellphone so they could contact people in their home countries. With their consent, we recorded phone calls and voice mails. We sent WhatsApp voice notes and used Facebook Messenger while I took photos with my medium-format camera. The results, edited excerpts of which are printed here, were beautiful shared moments, testimonies to hard times and reflections of uncertainty. Hi, Juli. I’m Jane, your sister. I send you my regards from … (laughs) … from Tijuana. And we want to tell you that we love you so much, all of us, your family. Thank God we met a friend, and he offered us to message you. Send my regards to all the family and friends. Tell everyone who asks for us that we love them so much, and if God allows it we will achieve our goal, and well. … We will keep in touch further along because we don’t have a way to communicate. Take care of yourself, and God bless you forever, today, tomorrow and always. Do not forget that we love you. 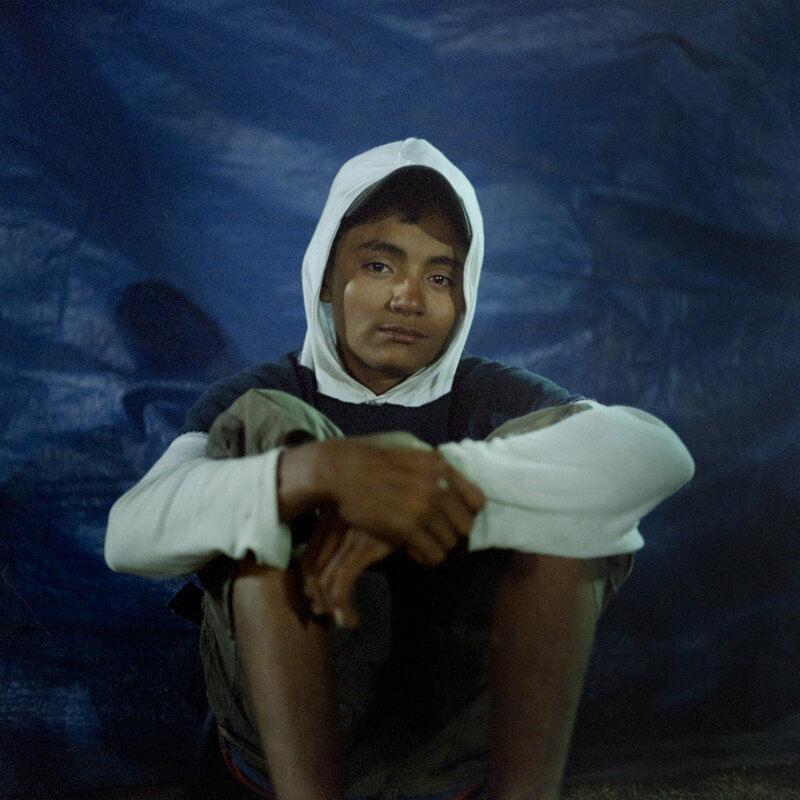 Maynor Melendez, 16, from Tela, Honduras. Facebook voice note to his mother. Nov 19, 2018.
in Tijuana mom. I’m sorry that I haven’t been able to send you messages mom. I know that you have been thinking about me mom. I’m fine, I’m with friends mom. I love you so much, you know it mom. I love you so much, so much mom. And how are my brothers? Kimerli Yorleni, 23, from Tegucigalpa, Honduras. To her sister and her mom. Nov 30, 2018. Phone call excerpt. We leave on Wednesday, to the other side. . . . Don’t despair, old lady. Yes I’m fine, don’t despair. Little by little. Fighting but . . . little by little. No, Mommy, I’m moving forward. We are going with the “Gringo.” . . . And the kids? What are they doing? . . . Mireya? Iris? Why don’t they answer? No, I’m fine, don’t worry. No, I’m leaving, nobody can stop me. Yes, take care of my kids. Enroll Astrid. Enroll Astrid. What’s up, love? Pass me to Mommy because I don’t have a lot of credit. Cristian Javier Quezada, 17, from San Juan, Hon- duras. Facebook voice note to his brother. Nov 17, 2018. Chavi I’m here in Tijuana, send me the number of my mommy to call her. I got a phone but it was stolen out there, in Tierra Blanca. Tell my mommy that I’m in Tijuana, in the border of the United States. Send me her phone number so I can call her. José María Avelar (45), from Ocotepeque, Honduras. To his wife. Nov 23, 2018. Whatsapp voice note. We haven’t been able to get out of here because things are very serious. . . . Take care of my daughters. As much as you can. Take care of yourself, too. . . . I was able to communicate with my brother, I will probably let you know if he helps me or not. . . . I even left cut soybean grain in the middle of the ranch. . . . Look for my nephew so he helps you to pick them up. Even if it’s just enough so that you can survive there. Because I can’t send you anything even if I want to. . . . I love you very much. Eusebio Diaz, 29, from San Pedro Sula, Honduras. WhatsaApp voice note to his wife. Nov 20, 2018. Well, Jenny, I’m calling you to tell you that I’m doing fine. It’s Chevo. I wanted to tell you that we are on our way to Tijuana. And well, thank God we’re doing fine. We wish to make it to Tijuana alive. Take care. I love you so much, and I’ll always be there, looking after you. Keep the money in case I need it, when I arrive to Tijuana I will call you. And if God allows ... we’ll see what happens. Pay attention to your phone. Michel Galdamez ,12, from Ocotepeque, Honduras. WhatsApp voice note to her grandmother. Nov 12, 2018. Hi grandma. How are you? I hope you are well in health. Say hello to my aunt Isamar, my uncle Kevi- to, my uncle Adenai. Tell everyone in the family that I love them so much and that I miss them. And you too, grandma. I hope that you are well in health, did you hear me? We are doing fine, thanks to God. The whole family is going. My aunt Yami, Chepe, my uncle Chonte, my mommy, my uncle Nelson. Even little Juan is here.